Photo: Decatur and Kate Dickinson House, ca. 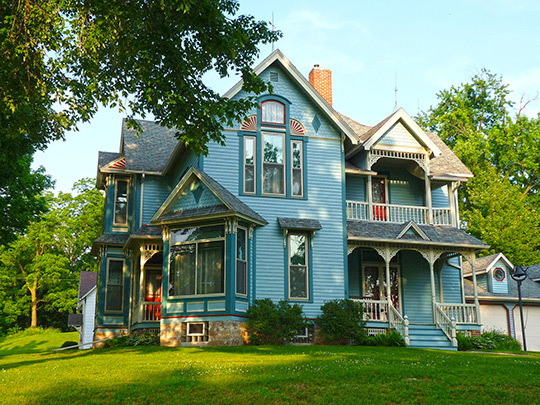 1891, 411 State Street, Neillsville, WI. Listed on the National Register of Historic Places in 2007. Photographed by User:Jeff the quiet (own work), 2011, [cc0-by-1.0 (creativecommons.org/publicdomain/zero/1.0/deed.en], via Wikimedia Commons, accessed July, 2014. The Clark County Courthouse is located at 517 Court Street, Neillsville, WI 54456; phone: 715-743-5150. Clark County was created from territory taken from Jackson County through legislation approved on July 6, 1853. The Black River runs north to south, within the county, dividing the county into two nearly equal parts. In the mid 1800s, abundant pine forests lined the Black River. The Black River became the perfect highway on which to float the harvested logs to the mills of Onalaska and La Crosse. James and Henry O'Neill cut the first road into Clark County. Starting in Black River Falls, in Jackson County, they traveled by oxen drawn wagons arriving to what would become Neillsville in 1845. A cabin and sawmill were built and the harvest of the pine forests began. Over the next forty years, logging concerns would cut 8,000,000,000 board feet from Clark County. Patricia Lacey, Hearman M and Hanna Hediger House, Clark County, WI, nomination document, 2012, National Park Service, National Register of Historic Places, Washington, D.C.